Once "The Mother We Share" gets stuck in your head, you're going to be obsessed forever. Just a warning. 1. This is Chvrches, a pop band from Glasgow, Scotland. 2. The name is pronounced "Churches," not "Chvvvr-ches" or something weird like that. This just makes it much easier to find them in a Google search. 3. This is Lauren Mayberry. She's the lead singer, and also plays some synthesizer. 4. Before Chvrches took off, Lauren was pursuing a career in writing. She has a master's degree in journalism, and won a prestigious journalism award back in 2010 for an article she wrote about the hygiene of body piercing. You can read her story in full in this PDF file. 5. She also has her own recipe for beef and chorizo chili. 6. And, uh, she can do a pretty good impression of Gollum from Lord of the Rings. 7. This is Iain Cook. He plays synthesizers, plus some guitar and bass. 8. Before Chvrches, Iain was a member of the Scottish indie bands Aerogramme and The Unwinding Hours. 9. This is Martin Doherty. He plays synthesizers and samplers. 10. Martin used to be a touring member of the indie band The Twilight Sad. 12. Iain recorded Blue Sky Archives' EP, and started Chvrches after inviting Lauren to sing on some demos he had recorded with Martin, who he knew from back when they went to school together. 13. 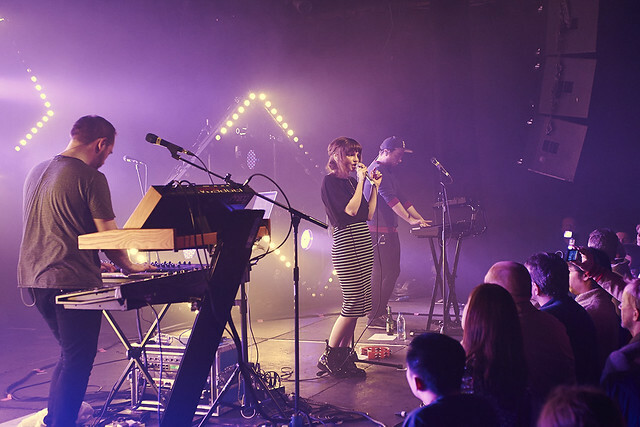 Chvrches debuted their first demo, "Lies," on the Neon Gold blog in May 2012, and they were pretty much immediately popular in the music blog scene. 14. A few months later, the band released another amazing song called "The Mother We Share." 15. The trio built on their hype by touring relentlessly through 2012, with headlining and festival gigs mixed in with high-profile support slots with like-minded bands like Passion Pit, Depeche Mode, and School of Seven Bells. 16. Chvrches started off 2013 by putting out yet another ridiculously catchy song called "Recover." 17. The band is finaaaallllllly releasing its first album, The Bones of What You Believe, on Sept. 24. 18. It includes all of those songs, plus "Gun." They made a pretty trippy video for that one. 19. Part of the reason it took a while for their album to come out is because they are fiercely independent, and made sure their record contract gave them a huge amount of creative freedom. Here's a quote from Lauren in an interview with The Guardian. 20. As you would probably guess by listening to their music, Chvrches are heavily influenced by a lot '80s pop, and they've mentioned in interviews that they're big fans of Cyndi Lauper, Kate Bush, and The Cocteau Twins. 21. They also love Whitney Houston, and have been talking about covering "It's Not Right, But It's Okay" at upcoming shows. Here's Lauren talking about how much she loves that song. 22. That hasn't happened yet, but they do an excellent version of Prince's classic "I Would Die 4 U" in concert. 23. And they recorded a pretty great cover of Haim's song "Falling" for the BBC's Live Lounge. 24. Chvrches also make a lot of remixes, like this fun, bouncy version of MS MR's song "Hurricane." 25. Unlike a lot of bands, Chvrches make a point of personally writing everything on their Facebook and Twitter accounts. Here's Martin explaining why they care so much about that in an interview with Out of Order. 26. But even if you propose very nicely in a tweet, Lauren will not marry you.